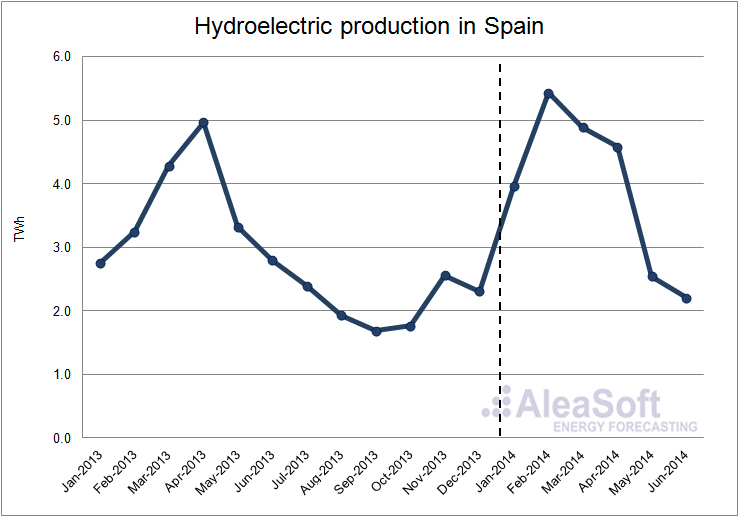 July 7th, 2014 – The price in the wholesale electricity market MIBEL in Spain has evolved accordingly to the usual seasonal evolution of the hydroelectric and wind power production during the first half of 2014. 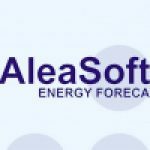 The average price in these six months has been 33.07 €/MWh, and the lowest monthly average was in February with 17.12 €/MWh. 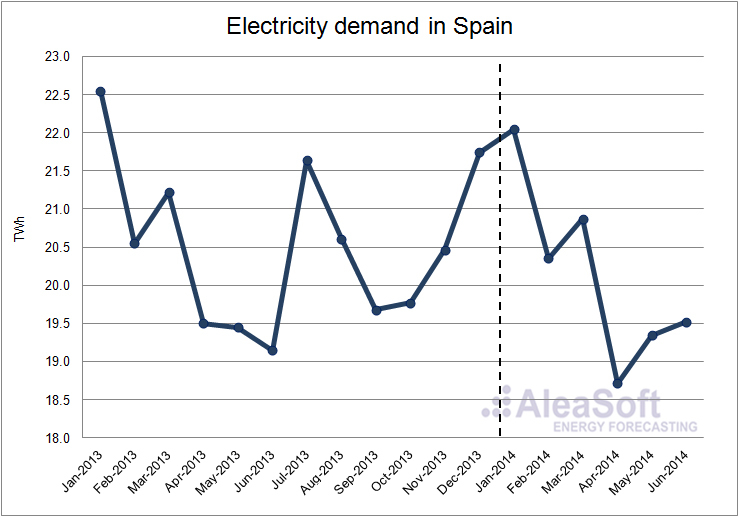 During the first six months of 2014, the electricity demand in Spain has diminished by 1.2% compared to the same period of 2013. Once corrected by the effect of working days and temperature, it represents a slight increase of 0.1%. 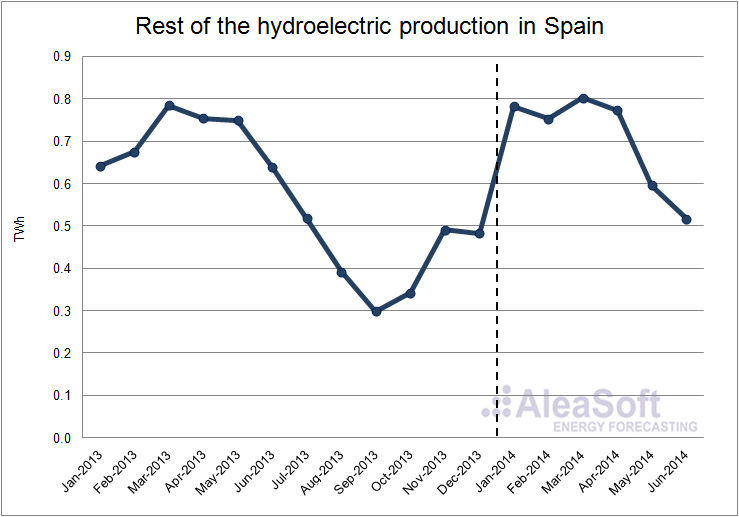 The electricity demand in Spain during the first half of 2014 has lowered by 1.2% compared to the first half of 2013. Data published by the system operator (REE, standing for Red Eléctrica de España) indicates that, once adjusted by working days and temperature, the electricity demand slightly increased by 0.1%. Quarter by quarter, during the first quarter a year-on-year fall of 0.4% in the corrected demand was registered (variation of -1.6% without correction), instead, in the three months of the second quarter the corrected demand grew by 0.5% (variation of -0.9% without correction) on a year-on-year basis. The wind power production has diminished by 2.3% in the first half of 2014 compared with the production with this technology during the first half of 2013. Such a production decrease is caused by the weather conditions, but the main reason is that not a single MW of wind power was installed in 2014 (REE data until May indicates a decrease of 6 MW in installed wind power). 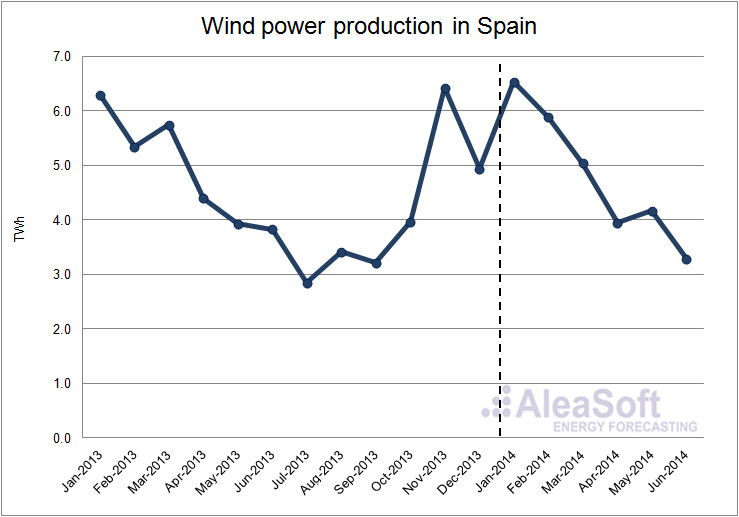 Wind power production evolution in Spain.. The overall hydroelectric production in the first six months of 2014 has been 10.4% higher than in the same period of 2013. However this year-on-year growth of production was due to a growth of 38.9% during the first three months of the year, while the year-on-year variation between April and June was -15.9%. Even being the shortest month, the largest monthly hydroelectric production in 2014 was registered in February, with 5,427 GWh, that is also the largest monthly production since 2010. 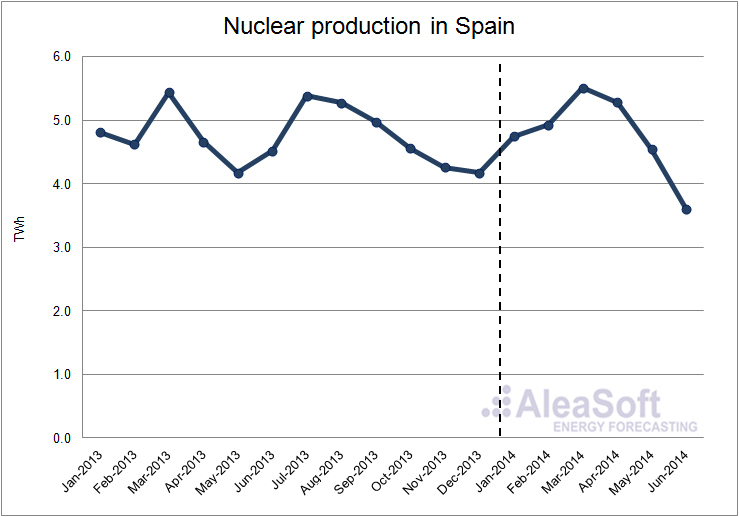 The variation of the nuclear production in the first half of 2014 compared to the same period of 2013 has been relatively small (+1.4%). However, month by month, important year-on-year variations can be found: the month with the largest positive variation was April with +13,4%, and the month with the largest year-on-year fall was June, with -20.4%, when occurred three nuclear power plants outages occurred. 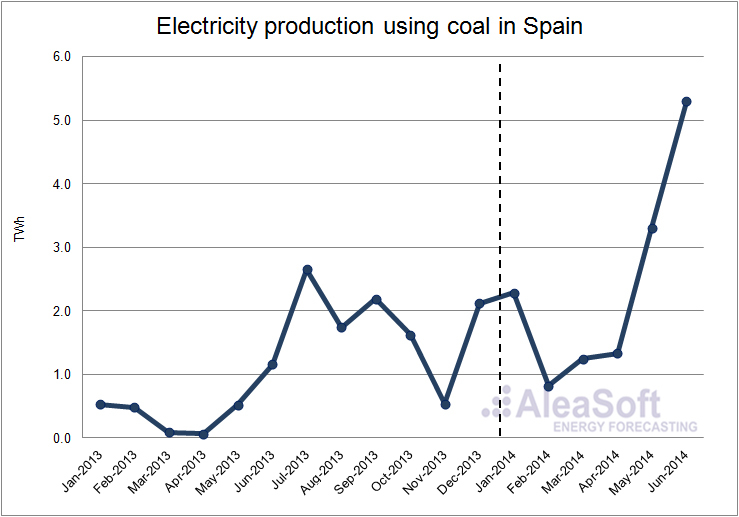 The electricity production using coal in the first half of 2014 has registered a large relative increase due to the very low production values corresponding to the first months of 2013. Thus, the increase of production compared with the first half of 2013 has been 404.3% (11,441 GWh). The most important increases compared to the same months of the previous year have been registered in May (+2,786 GWh) and June (+4,143 GWh), when the production using coal has covered the seasonal fall of the hydroelectric and wind power production, together with the decrease of the nuclear production. Other factors, as the diminution of production using combined cycles and with cogeneration also contributed to the increase of production using coal in 2014. 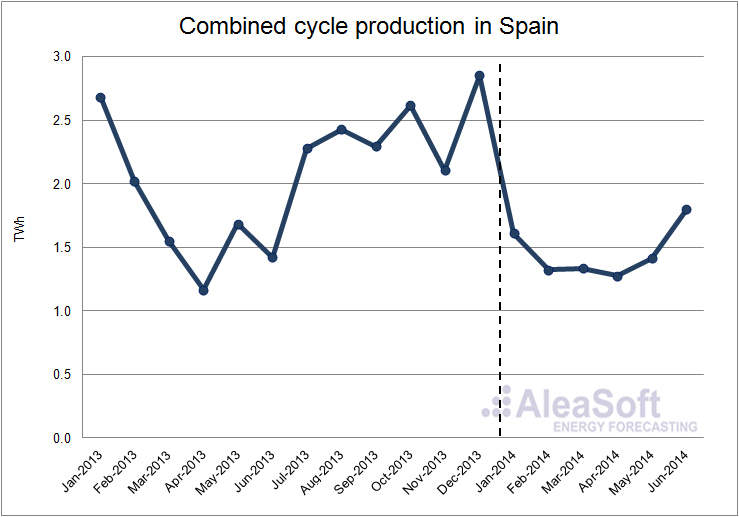 In the first half of 2014, the combined cycle production has diminished by 16.8% compared with the same period of 2013. The most important variation occurred in January when the production was 40.0% lower than in 2013. The combined cycle production has been lowering constantly since 2008, and in 2014 it is only 20% of what was produced then. The use factor of the combined cycle power plants has been reduced in a similar way until values below 10%. The combined cycle production dropped sharply during the first half of 2013, up to 46.1% compared to the first half of 2012. The decrease in the production was constant over the two quarters, 47.5% year-over-year in the first quarter and 46.8% year-over-year in the second quarter. 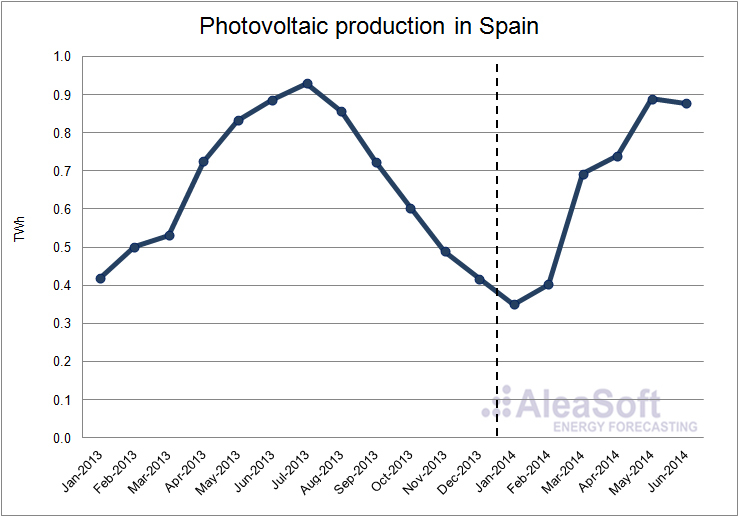 In the case of the solar photovoltaic production, a slight increase of production of 1.5% has been registered in the first half of the year compared to the first half of the previous year. During 2014, installed solar photovoltaic power did not increase according to REE data until May. 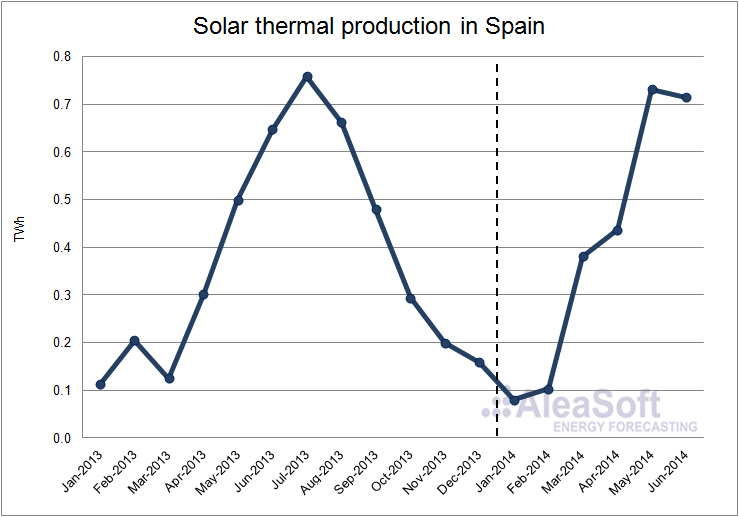 On the other side, the solar thermal production has grown in a remarkable manner, namely it is 29.5% larger than the first half of 2013, even with no increase of the installed power in 2014 (until May), according to REE data. In the second half of 2013 250 MW were installed. 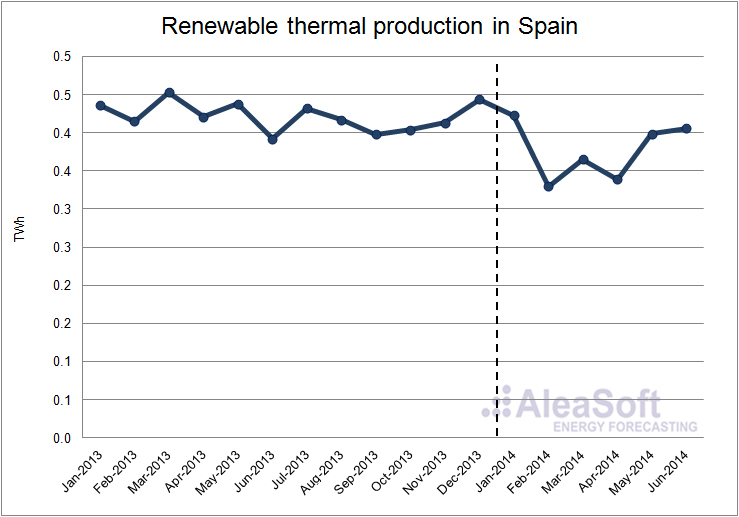 The renewable thermal production has fallen by 11.5% in the first half of 2014 on a year-on-year basis, mostly affected by the retroactive reduction of incentives to the production with renewable technologies in Spain. The rest of hydroelectric production, that includes production units smaller than 50 MW, has remained relatively stable on a year-on-year basis with a slight descent of 0.5%. 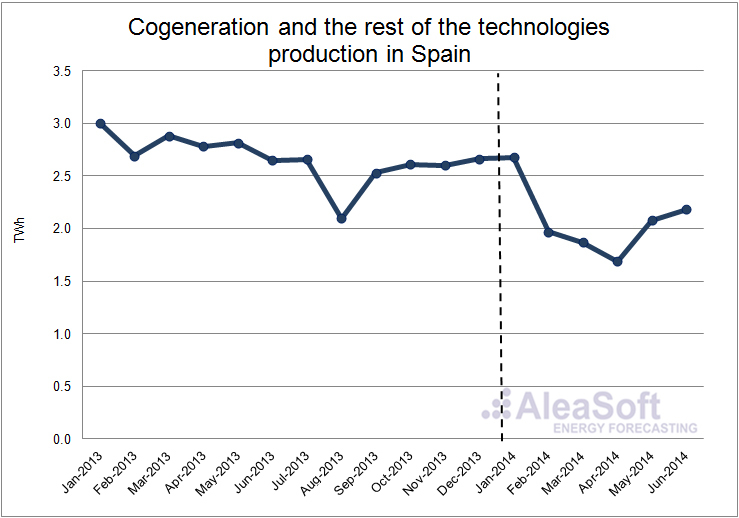 Finally the cogeneration, together with the rest of the technologies, suffered a descent of their production in the first half of 2014, quantified in 25.9% on a year-on-year basis. In April the year-on-year reduction was 39.4%. Modifications in incentives to the technologies belonging to the old special regime affected severely the cogeneration plants, which are announcing stops in production or even its permanent closure since the beginning of 2014. The price of Zeeburgge gas has fallen continuously during the first six months of 2014, starting with an average price of 26.35 €/MWh in January, to 17.61 €/MWh in June. Comparing these prices to the ones in the first half of 2013, the fall is even more remarkable due to the high prices registered in March 2013 (31.24 €/MWh) when low temperatures covered Europe. The price of the Brent oil barrel has remained quite constant around the average value of $108.93 in the first half of 2014. The difference with the average price in the second half of 2013 is -0.79$/barrel. 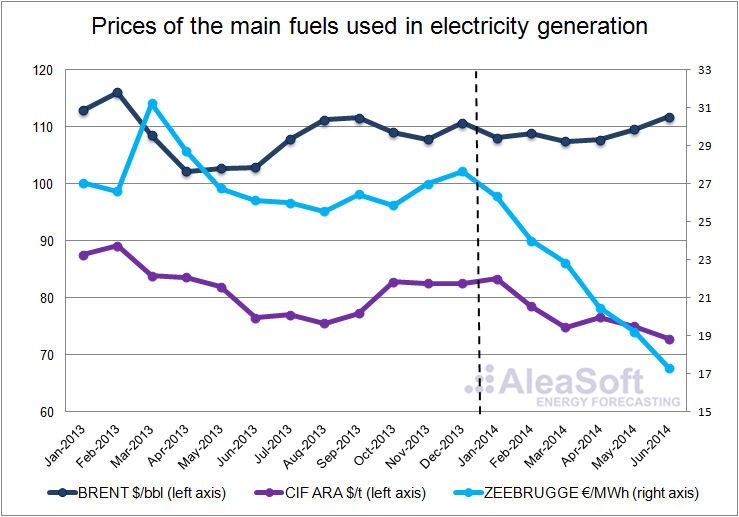 The trend of the CIF ARA European coal during the first half of 2014 has been descending, the same trend registered during most part of 2013. The average price in January was 83.38$/t, and the lowest average was in June with 72.85$/t. 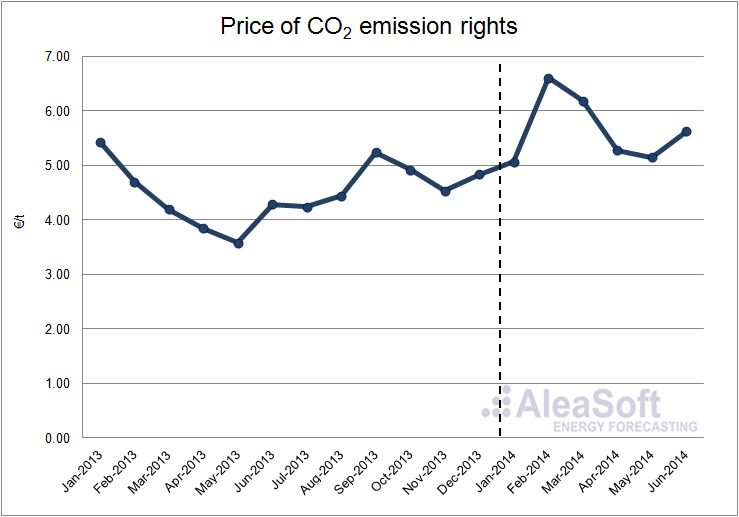 The average price of CO2 emission rights in the first half of 2014 has been 5.64 €/t, 0.95 €/t higher than the average of the previous six months. The highest monthly average price occurred in February with 6.61 €/t. 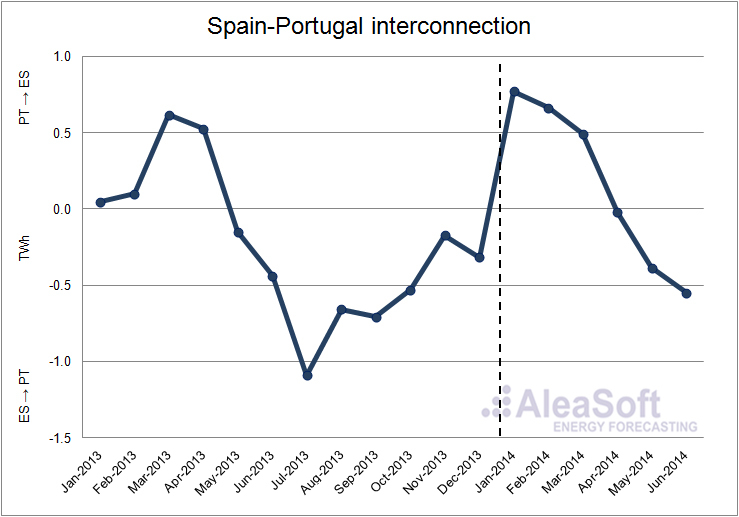 In the first six months of 2014, the net balance electricity exchange between Spain and Portugal established Spain as a net importer, with 975.6 GWh imported. The net balance electricity exchange with Portugal followed the same direction than in the first half of 2013, but, during 2014, electricity imported from Portugal has increased by 39.2%. Since May 13th, the MIBEL market operates coupled to the rest of South-Western Europe (SWE) and North-Western Europe (NWE) markets. The price in the day-ahead market is determined with the PCR system, common to all markets in SWE and NWE. This coupling also means that the exchanges between Spain and France are carried out implicitly in the day-ahead market. 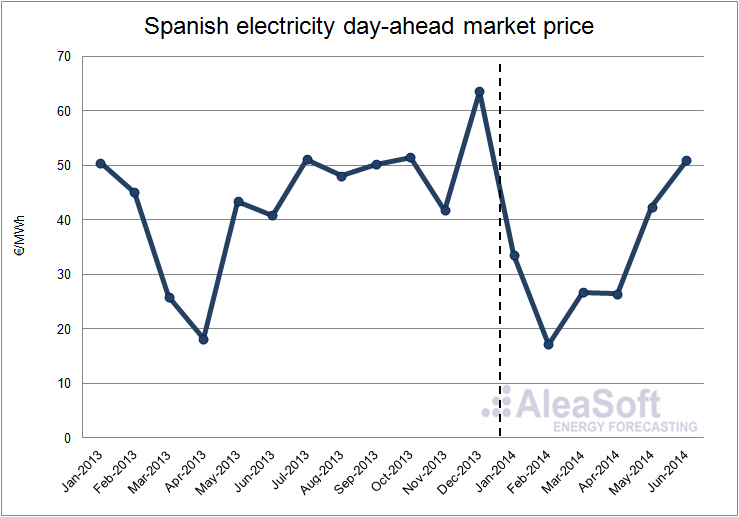 After the high prices registered in December 2013, at the beginning of 2014 prices in the day-ahead market MIBEL in Spain fell until an average price of 33.62 €/MWh, 16.89 €/MWh less than in January 2013. Since then, prices showed the usual seasonal behaviour with the lowest monthly average price in February with 17.12 €/MWh, 27.93 €/MWh less than in February 2013, at the same time that the maximum of hydroelectric production and a very high wind power production. The average price in the market during these first six months of 2014 has been 33.07 €/MWh, 4.22 €/MWh less than the first six months of 2013. The highest hourly price, 113.92 €/MWh, occurred in hour 20 of the March 27th. The lowest one was 0 €/MWh and occurred during 177 hours between January and March.